Convergence 2015: The Trick to Predicting The Future? While Future Decoded ended only a couple of weeks ago, we’ll be jetting off to Barcelona next week for Convergence EMEA: Microsoft’s premier ideas, technology and Microsoft Dynamics-focussed expo for Europe. We’re expecting a lot from the expo, and with some fantastic sessions and key speakers to check out, there’s plenty to be excited about. Ideally, we’ll receive more confirmation from Microsoft that Dynamics is at the heart of their strategy – something that was hinted at Future Decoded. Whether you’re attending yourself, or you’re a keen observer, here’s our action plan. Whether you’re working in a Microsoft Dynamics job as a developer, you’re a key business decision maker or you’re an experienced CIO, Convergence is the place to be if you consider yourself a forward-thinker. In essence Convergence 2015 will be the place to be to learn from those in the know about the predicted trends in technology for the next stretch. The big keynote speeches like Monday’s Digital Transformation in The Age of The Consumer, and a Microsoft-customer-driven keynote like Wednesday’s Transformational Change: The View from Inside will provide us with valuable insight into the future of technology. We’re thinking digital transformation through mobile-first, cloud-first, right, Nadella? Meanwhile, breakout sessions like IBM and Microsoft: Making a Difference Together will demonstrate the power of organisations partnering up with Microsoft to develop the exciting new technologies we’re all going to need in the future to meet consumer expectations, as well as to face the global challenges of the modern world. In other words, if you’re looking for the big picture, Convergence is the place to be. For a list of all the key speakers, breakout sessions, client showcases and more, click here and build your personalised schedule. Convergence isn’t just any old expo. It’s perfect for networking, demonstrating your own knowledge and ability, and more. With so much on offer, it’s vital you’re prepared, regardless of whether you’ll be attending or joining in the action online. Social matters: It’s 2015, so obviously social media matters. 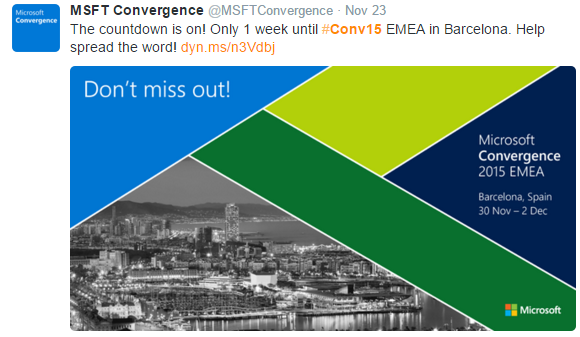 Jump on Twitter and use #Conv15 to join the conversation. We’ll obviously be there. Agenda: If you’ve not looked at the full agenda yet, here it is in its full splendour, separated out into Convergence Experience Centre and Keynote categories. Get the app: Most expos, festivals and events come with their own customised app, and Convergence is no different. Organise your schedule, check out the speakers, leave an evaluation and find directions on the map. Network: There’s a Welcome Reception in the Convergence Experience Centre on Monday from 17:00-19:00 which is perfect for catching up with old friends, meeting up with your existing colleagues. We’re obviously switched onto the Microsoft Dynamics industry so we’re expecting a lot of in-depth detail about Dynamics. We also appreciate that Microsoft Dynamics technologies like AX, CRM and NAV are all part of a bigger picture that includes Azure, Office 365, Power Bi and more, so we’re looking to learn more about how Dynamics will feed into those technologies, too. If you’re looking for a Microsoft Dynamics job and want to demonstrate industry knowledge and technical expertise, as well as a passion for future technology and business innovation, keeping up with Convergence 15 is a no-brainer. We’ll have plenty to say over the coming days before the expo kicks off on Monday 30th, so stay tuned for more from us. In the meantime, if you’re looking for a Microsoft Dynamics job, get in touch today on +44 (0)1483 233 000.